Having a home in a 55 and older lifestyle community around Charleston has tremendous benefits, including instant friendships, an abundance of amenities, and numerous attractions including historic landmarks in downtown Charleston; nationally recognized golf courses like Kiawah Golf Club, acclaimed restaurants serving southern culinary cuisine; and miles of soft, white sand beaches. In the northern region of Mt. Pleasant, the mega development Park West features a “55 and better” community called Liberty Cottages. A gated neighborhood, Liberty Cottages is comprised of 43 single family homes ranging in size from 2,700 square feet to 3,100 square feet. In addition to amenities in Park West, which include a resort style and an Olympic-size swimming pools, walking trails, tennis courts, playgrounds, retail shops, and restaurants, residents at Liberty Cottages are treated to full-service home maintenance that includes lawn care and appliance repairs. As an added bonus, Liberty Cottages has an exclusive agreement with Somerby in Mt. Pleasant, thus allowing residents access to full health care, transportation, laundry, and personal services. Known as the “flowertown in the pines,” Summerville is home to three 55 plus communities. In the historic district, the Pines at Gahagan is a 25-acre, gated development with 109 single family homes. The community features resort-style amenities including a private swimming pool, a 4,700 square clubhouse, fitness facility, billiards room, library, and arts and crafts room. Del Webb Charleston, located within the gated, 360-acre master development of Cane Bay Plantation, is a premier active adult community. Not only does this neighborhood feature desirable amenities such as an indoor heated swimming pool, outdoor heated swimming pool, fitness center, dog park, bocce courts, tennis courts, and even pickleball courts, but it also has numerous clubs and hobbies for residents such as astronomy, fishing, and beer tasting to name a few. The Elms of Charleston and Southern Palms, located in North Charleston and Ladson respectively, are two other 55 and better communities that feature affordable, charming cottage-like homes and an array of amenities and on-site activities. 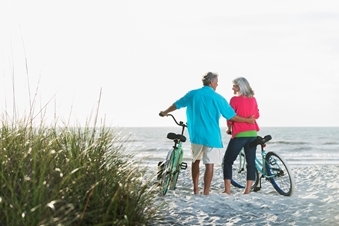 For retirees or semi-retirees, the 55 and better communities in the Charleston area are the perfect marriage between an active lifestyle and a worry-free environment.